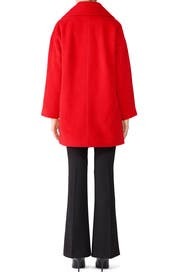 An effortless, oversized fit and plush wool define this cold-weather essential by Trina Turk. Pair with the Colorblock Pashli Mini Satchel. Red twill (42% Wool, 24% Viscose, 20% Alpaca, 14% Acrylic). Coat. Long sleeves. Hidden front button closure. Fully lined. Front pockets. 32" from shoulder to hemline. Imported. Runs big but great jacket! Size 6 was super large could have went with a 2. But still a great coat! Size way down. I usually wear a 6, but based on reviews, I ordered a 4. It was still far too big. 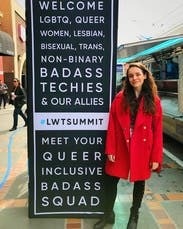 I didn't wear the coat so can't comment here. Fit beautifully and was so warm. Also, it photographed so well. Would rent again. Runs a bit large, but the cut is supposed to be baggy. the pocket flaps are odd bc the real pockets aren't where the flaps are. the color is gorgeous though, it's warm enough for 30 degree weather, and the fabric is nice and soft. I get so many compliments on this coat. I'm considering buying it. It soft and warm enough for most winter days for me. Loved this so much I wore it for a work photo shoot! 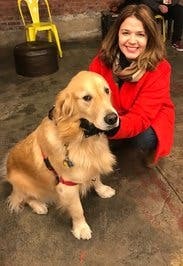 This coat makes a great statement and I got tons of compliments on it! I would say that it's fairly warm but I wore a warmup jacket under it in NY- if you're dealing with 20 degree winter days, you'll want something warmer, but it's good for weather on the high 30s and up. The size two still gave me a great boxy shape without being too big, and my friend who was going to get it in a size six tried it on and it also fit her no problem- so definitely get a size down! Loved the color- an orange red, almost "safety" orange. Loads of compliments when I wore this. Very warm and perfect for 35-45 F weather. Very very over-sized. I possibly could have gone down 2 sizes. Silky pockets, very well made, soft and furry shell, gorgeous color. A real eye-catching coat. Good for the mildly chilly day. Boxy, oversized fit. I didn't wear this. I expected it to be oversized, but on me it was really big and looked silly. 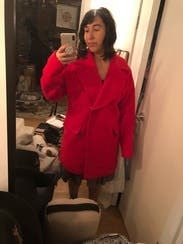 I own another Trina Turk coat in a size 6 that fits perfectly. This might look better on somebody taller than me (I'm 5'4"). This coat definitely runs large, but I liked it. It's a great vibrant color and I almost didn't want to return it. THE most beautiful color ever. This coat is gorgeous. The color is a rich orangy red. It's a little oversized but I like that style. It's also super warm. Love love love. Loved it! The color is beautiful! 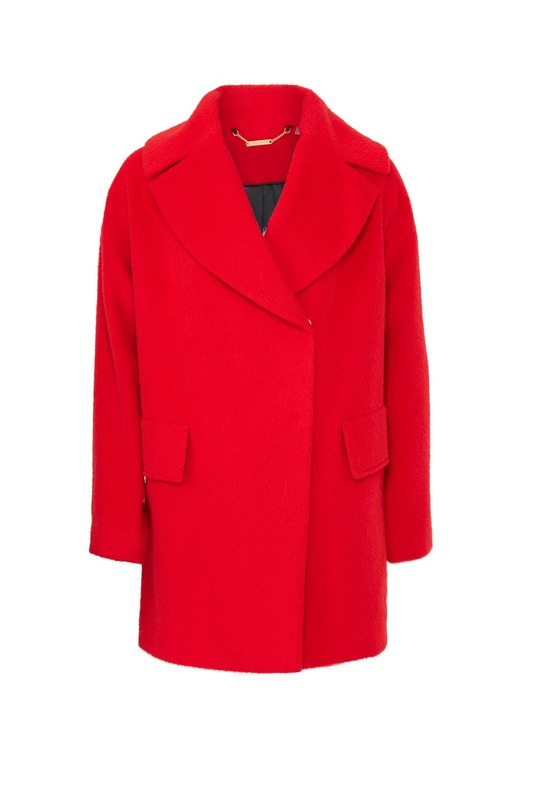 Loved this red coat. I wore it a few times with a variety of things: a blush dress for work, a white top and black skinny jeans, etc. it looked great with everything. If I were to rent again, I would rent a size 8. The 8 wasn't available so I went with a 10. Normally I'm a 10, so I though it would be fine, but it was quite large. Beautiful color and cozy as a blanket! Love Love Love this Coat. Perfect for every occasion. Wore with jeans, suits, and cocktail attire. Warm, soft, and stylish. Lots of compliments. Only issue was it is REALLY big. I am usually an 8, ordered a 6 based on other reviews, and wish I'd gotten a 4. 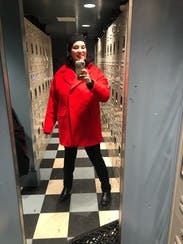 Wore this out for drinks and everyone who saw me in it said some variation of "I love that coat, it really makes your features pop." Also comfy and warm. Awesome color and fit. Received tons of compliments! Will rent again in the future. I loved this coat. It's such a rich beautiful color. I wore it everyday for the month of February. It was great for wearing over my suits for work but still looked good with jeans and a sweater. It's a little bulky but it is warm. My favorite of the coats I rented. Maybe it's the style, but this coat ran so large I felt like I was swimming in it. When I tried it on, my 3 year old asked if it was for Santa. I had to send it back. 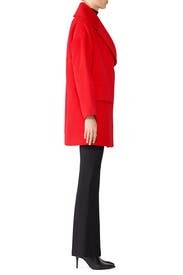 This coat is comfortable but shapeless. I would have kept it longer but it doesn't keep me warm because so much air enters from the gaps in the top and bottom. Additionally it is too short to wear with a dress. However, the fabric and color are beautiful. Fit is really cute on, slighty vintage in cut. Great true bright red. The one I had was just slighty worn- was almost fuzzy. Nice jacket for anyone looking for a casual bright look. runs WAY big. i think it is meant to be oversized but just looked ridiculous on me. Just wore it for the daytime! 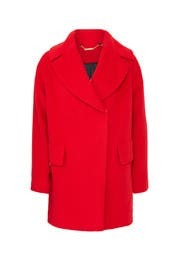 I was really excited about this coat, but ultimately wasn't in love. The fabric was a little thin and felt very felt-like, and wasn't super warm. I thought it would be a little more structured, but the fabric was really soft and kind of droopy, if that makes sense. It looked cute on, but just wasn't for me! I will be sticking with more tailored coats in the future, I think. It's a bigger fit but its cute that way. This jacket would look amazing on someone with a different weight distribution. Mine's all over, so this just added to the round dumpling effect - but it would look so great on someone with either an apple or pear shape. The color is vibrant and bright and gorgeous. I fit two sizes smaller than my usual with a nice sweater underneath. I didn't wear it out, because the cut didn't flatter. Loved this, great color, thinking of buying. 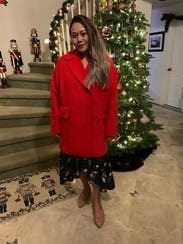 Not the warmest coat, but perfect for the holidays. Great when I visited my parents in Southern California, not so much for NYC winters. I downsized AND wore an oversized sweater and STILL huge on me. Could not wear it. I should have gone down 2 sizes as recommended by everyone else! I love this. A friend remarked how she is always wearing her ski jacket b/c that is so comfortable. I made her try this on. Looks great and feels great. 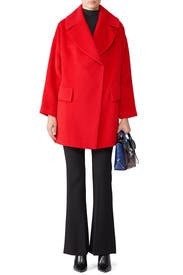 The color is beautiful but the coat is super big. I sized down to a 2 and probably could have used 2 more sizes down. Fun printed lining. The picture is true to color. It is BRIGHT red. I think it's got a bit of reddish orange in it; that's why it's so red. I love it tho. It adds a pop of color in a sea of black coats. It instantly, instantly brings an otherwise boring outfit up to a whole new level. I walk with more confidence with this coat on. I wore it to work and going out. It is pretty warm. I was able to wear it in +35 F weather in NYC. It does run a bit large, but I like that because I can wear a chunky sweater underneath comfortably. I would highly recommend it. Rented this for every day wear. Fit was oversized, would recommend sizing down one. The color is gorgeous! This coat was meant to fit loose and have a "draped" effect. It looked great with a fitted outfit underneath. Could probably have gone down a size, but I liked the looser fit. I have olive skin, and it was just the right shade of red. Loved it!